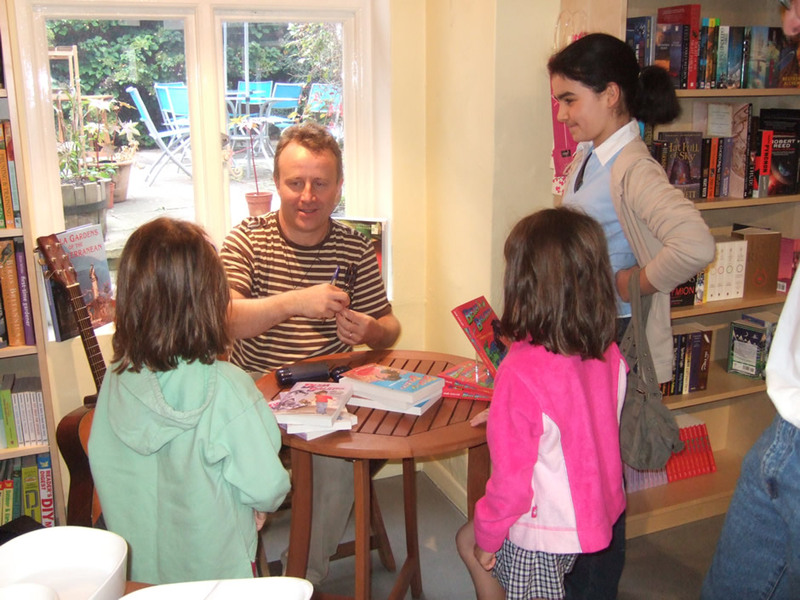 We had our first author event in the shop today - Bella Balistica author and creative writing consultant Adam Guillain performed storytelling and answered questions about his books. It was a lot of fun. Having got in early, James and I spent the morning moving tables and preparing a space in the front of the shop. We weren't quite sure how many people to expect. Adam arrived with his wife Charlotte and two children (George and Anna), but as 11am neared I got increasingly nervous as we only had one attendee (our nephew Oliver) and I was beginning to think we should have started our publicity earlier. However, by the time Adam started we had a dozen children, and a smattering of adults - and the event was a fantastic success. Adam is a very entertaining storyteller. 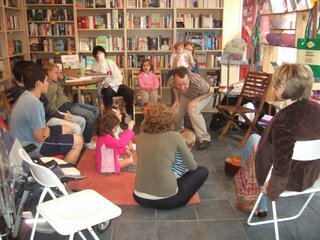 He used music and props very cleverly to get everyone joining in, and as the children were aged from 1 to 12, he performed brilliantly to keep everyone enthralled (including the shop owners!). 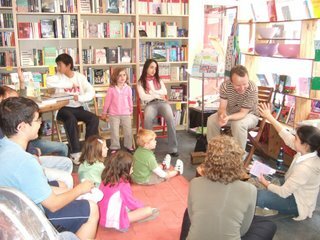 Rather than read from his books, he took questions from the children who not only asked him about his books and characters, but took the opportunity to tell him about stories they were writing. 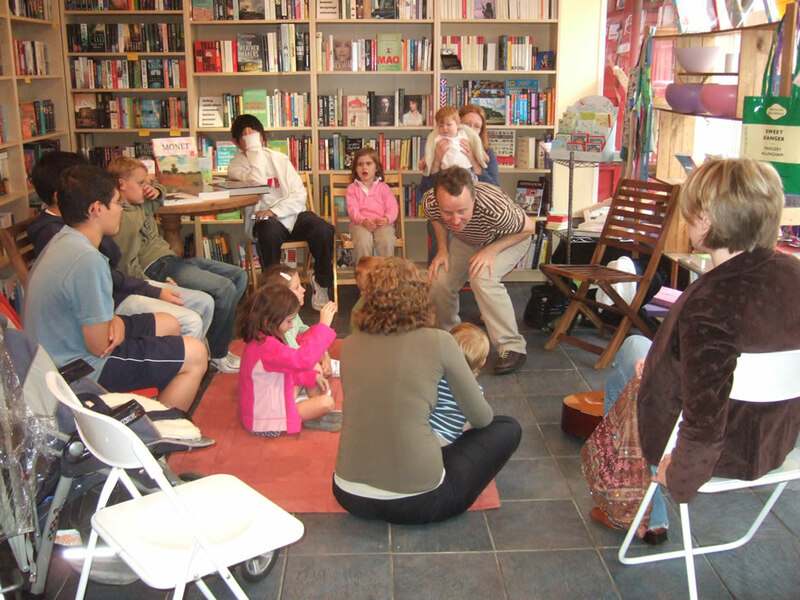 For some reason, we had a lot of budding young authors in the audience. Adam then signed copies for some of the children, as well as some for the shop. At one point, someone visiting the shop asked to take a picture, which at the time I thought nothing of. However, it was none other than the mysterious Abingdon blogger (referred to in yesterday's post) who beat us to reporting on the event. It was a really nice write-up - so thanks, whoever you are (at least I now know what he looks like!). Anyway - a big thank you to Adam, and Nicki and I hope this is the shape of events to come. (And a reminder that we have storytime this Monday (and every Monday) - 10am for toddlers, 2pm for under-5s).